Smile More Hotel is set up to keep guests smiling with unique hospitality services on offer. It has a beautiful edifice strategically sited in a serene environment optimized for comfort. This hotel houses well-decorated rooms to meet the lodging needs of a wide array of guests. Its location is at Km 4 Ikot Ekpene Road, After Zone 9 Police HQ Ehimiri Housing Estate, Umuahia. This hotel is about 11 minutes’ drive to the Government House, Umuahia. 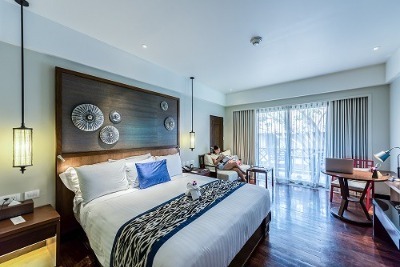 Smile More Hotel has spacious rooms decorated with modern finesse. Every room is air-conditioned with king sized beds, satellite TV, telephone, work desk, fridge and sofa. Bathrooms are en-suite with complimentary toiletries. Lodgings are classed as Standard rooms, Deluxe rooms, Royal and Executive Suites. This hotel offers varieties of local meals that can be accessed at the on-site restaurant and enjoyed in the spacious dining area, while the exotic bar maintains a full stock of drinks to suit various preferences. The power supply is constant while maximum security is guaranteed. Smile More Hotel also renders services such as concierge, luggage storage, laundry/dry cleaning and room services on request. Q: Does Smile More Hotel have a swimming pool? A: No, a swimming pool is unavailable. Q: Does Smile More Hotel offer complimentary breakfast? Q: Does Smile More Hotel offer free internet access? A: No, free internet access is unavailable. Q: Does Smile More Hotel have a gym? Q: Does Smile More Hotel allow free parking? Smile More Hotel is an affordable hotel in Umuahia, Abia. Checking into the hotel was not stressful, I could also pay with my credit card. However after checking in I found out that the lightening in the room I was given was bad so I complained to the receptionist who took me too another room which was a little better than the first one. Secondly, The heat in the room was to much due to the fact that the AC was not working well and the fan was not really functioning properly. Apart from these, the hotel was actually a fair. My stay was okay at the hotel,the environment is cool and neat.The location is nice, the staff is hospitable and friendly. They need to pay attention to details and improve on the maintenance. Have nice pictures of Smile More Hotel?